You’ve been added to CCC Alerts, Central Community College’s emergency notification system. CCC uses this system to make announcements for weather closings as well as other campus emergencies through text messaging, emails and automated voice calling. This system is automatically enabled on your account after registering for a course. To stop receiving text messages, text STOP to 67283. This will prevent any text messages from CCC Alerts. Upon login, you’ll see your personal profile, and can add additional phone numbers, emails or tailor your alert preferences to receive texts or not. 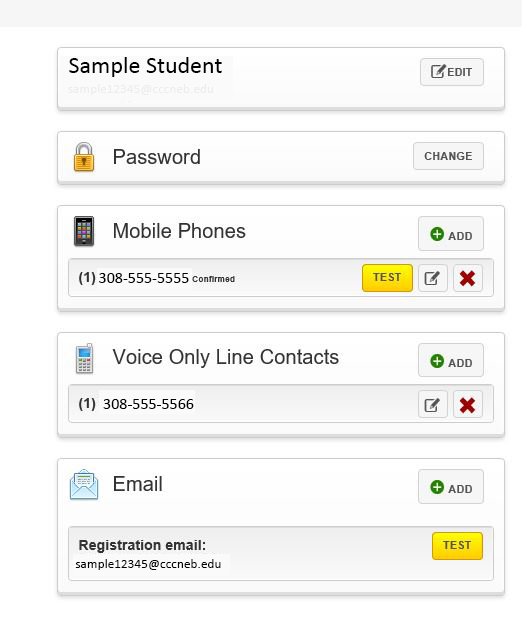 On the “My Account” page you can set phone numbers and email addresses. On the “Groups” page you can tailor your message delivery options. If you do not wish to receive text messages, you can remove the check from alert by text. To remove a phone number, click the Red X at the end of the "mobile phones" line on the "my account" page, then follow the on screen instructions to delete phone contact. Central Community College will conduct periodic tests of CCCAlerts. What kind of messages will I receive? CCC Alerts will only be used for emergency communications to advise and inform you of situations requiring immediate action or evacuation. Some messages may also inform you of school closings due to weather conditions. Your username should be your CCC e-mail address, or for employees, your computer login. What if I only want to receive texts, but not phone calls or emails? Your notification preferences can be changed at any time. You may choose to only receive certain forms of notifications.